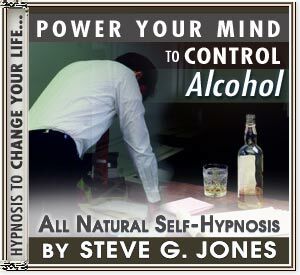 Power Your Mind to control alcohol with Hypnosis! Whether you are looking to stop drinking alcohol or moderate your consumption, my alcohol hypnosis program can help. Alcoholism is one of the most common addictions in the world. Its effects can be destructive to oneself and many illnesses result from its abuse. This Alcohol hypnosis MP3 can help you overcome the urge to drink and help you consume alcohol in moderation. Begin a new alcohol-free existence now or just reduce the amount you drink: this Hypnosis Alcohol Treatment program can help! My Dr. Steve G. Jones M.Ed. Alcohol Treatment hypnotherapy program uses a special blend of hypnosis, relaxation techniques and guided imagery that will enable you to regain control over your life! Why are our alcohol treatment programs so effective? By creating direct access to the most powerful part of the mind, the subconscious. With the help my Hypnotherapy alcohol treatment MP3 or CD, you can teach your subconscious mind to automatically act in the ways that best suit your goals, rather than relying on poor habits that you've built up over the years. When you align what you consciously desire with your subconscious motivations...your possibilities are endless! Q. Do I have a drinking problem - and can Hypnosis help me? Do you feel drinking is making you a happier person? Do you have a sense of remorse after drinking? Have you missed time from work or school because of your drinking? Has the quality of your performance at work or school declined? Have you ever blacked out or forgotten where you are while drinking? Has your drinking been the cause of tension or arguments with friends or loved ones? Do you think about drinking throughout the day? When you are drinking does it change your personality? Do you spend money you really can?t afford to at bars or on alcohol? If you answered yes to some of these questions, then hypnosis is the right tool for you to take control of your life and control alcohol?s role in it. Suddenly stopping alcohol consumption can have dangerous medical implications if you are an alcoholic. Hypnosis is effective in changing your thinking about how and how much you drink. You can safely reduce the amount you drink and find the confidence to quit altogether through hypnosis. Clinical Hypnotherapist, Dr. Steve G. Jones M.Ed., leads a self-hypnosis therapy that uses the strengths already within you to overcome any kind of addiction. Addictive behaviors may be driven by cravings but are also the result of habit. Replacing one habit with a healthier one can be achieved through hypnosis.